ColostrumPRO with Immulox enhances normal immune factors, providing dual action – in the bloodstream and in the digestive tract, to help maintain a robust intestinal lining and promote healthy intestinal flora. 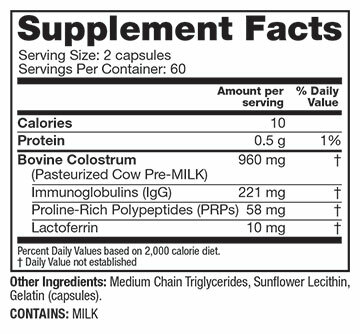 ColostrumPRO offers balanced immune support with 25% Immunoglobulins (IG), 1.5% Lactoferrin and 3% Proline-Rich Polypeptides (PRPs). Professional Strength PROSymbiotics® ColostrumPRO™ with Immulox® is the preferred choice of physicians worldwide. Quality and Purity Assured. Collected exclusively from USDA Grade A dairies and only from first milking. Laboratory tested and verified free from pesticides, antibiotics and rBHT hormones. Each bottle is double sealed for quality and safety. If either seal is broken or missing, do not use and call 1-800-421-1830. Close tightly and store in cool, dry place (below 75ºF), away from heat. Warning: If you have a physician-diagnosed health condition, consult your doctor before taking this product. Discontinue use if you experience adverse reactions and consult your doctor. *THESE STATEMENTS HAVE NOT BEEN EVALUATED BY THE FOOD AND DRUG ADMINISTRATION. THIS PRODUCT IS NOT INTENDED TO DIAGNOSE, TREAT, CURE OR PREVENT ANY DISEASE.